Maruti Grand Vitara 2.4 AT has been provided with a fresh and sturdy look from the outside that comes packed with smart features inside, and reloaded with a 2.4-litre VVT (Variable Valve Timing) engine. The Suzuki Grand Vitara SUV range has always been loved by the customers for its style and handling as well as its off-road capabilities. The new Grand Vitara 2.4 answers the customer’s need for more power. An all-time, 4-mode, 4-Wheel Drive (4WD) continues to ensure effective control across terrains. The interior display in the car has been enhanced with a new Multi Information Display (MID) providing easy to read and accurate vehicle information like Cruising range, Average speed and instantaneous fuel consumption, besides “low-fuel” warning. All these add up to enhanced user convenience and driving comfort. The stylish new front grille and front bumper gives the Grand Vitara a sleeker look while the 17-inch alloy wheels add dynamism. The snazzy new Maruti Grand Vitara 2.4 AT can be proud of its smart new exterior that gives one a prelude to the good things that await inside. The regular adjustable headlights are present as are the fog lights in front as well as the rear. A power adjustable exterior rear view mirror is another feature of the new Grand Vitara 2.4 AT . The rear wiper isn’t sensitive to rain but there are also rear window defoggers and washer that maintain a clear rear mirror for the driver’s convenience. The car comes with pre-fitted alloy wheels, although a rear spoiler is absent. With an exterior power antenna and tinted glasses, the Maruti Grand Vitara 2.4 AT makes for one sturdy-looking vehicle. The one conspicuous, but irrelevant absence is that of the turn indicators on the rear view mirrors outside. The vehicle is available in a host of colours, opening up the choice for the buyers –Metallic Silky Silver; Silky Silver; Metallic Azure Grey; Metallic Clear Beige; Cat’s Eye Blue Metallic; Blueish Black Pearl; Kashmir Blue Pearl; Graphite Grey Pearl; Azure Grey Pearl Metallic and Shining Pearl Metallic. The interiors of Maruti Grand Vitara 2.4 AT are well-fitted with modern in-car amenities and both look good and are essential add-ons to the driving experience. The pre-fitted air-conditioner also has an in-built heater facility. The car lacks leather seats but fabric upholstery too is a comfortable alternative. The tachometer, electronic multi-tripmeter and odometer come in handy for the driver to get accurate estimates on various specifications of the drive, like distance of individual trips, total distance covered and optimum RPM to change gears, thus also helping the user to manage fuel efficiently. The spacious glove compartment and a digital clock make up the other utilities inside the cabin, along with the handy gadget that tells the passengers the temperature outside. Fitted with a 2.4-litre, 163.5bhp 16V J Series petrol engine, Maruti Grand Vitara 2.4 AT can effectively displace 2393cc . The engine has the potential to produce a maximum of 163.5bhp at 6000 rpm, while the maximum torque it can produce amounts to 225Nm at 4000 rpm. This J Series engine contains 4 cylinders with 4 valves per cylinder, with Bore x Stroke being 92 X 90 mm, and the compression ratio being 10+0.2. Maruti Grand Vitara 2.4 AT complies with the emission norm of BS IV, with a valve configuration of DOHC and an MPFi fuel supply system. The car has been tested to give a mileage of 6.12 kmpl in the city, and an increased mileage of 9.24 kmpl on the highways . The acceleration and pick-up of the vehicle are quite competent. The engine is contrived to reach a decent top speed while giving a balanced and satisfying experience. The fuel tank has a capacity of 66 litres . While the front suspension of Maruti Grand Vitara 2.4 AT is a McPherson strut type, the rear suspension is a multi link type. Additionally, there are gas filled shock absorbers in the car. There are disc brakes in both the front as well as the rear of Maruti Grand Vitara 2.4 AT . The braking system is equipped with Electronic Brake-force Distribution (EBD) along with the Anti-lock Braking System (ABS). For better grip on the road, tubeless radial tyres are provided with a tyre size of 225/65 with 17-inch alloy wheels. Maruti Grand Vitara 2.4 AT offers a number of safety features. There are SRS airbags in the front for both the driver as well as the passenger. A head impact protection structure has been installed in Maruti Grand Vitara 2.4 AT along with a foot protection design for the brake pedal. There are 3 point ELR seat belts in the car both in the front as well as the back, however, the front ones come with pretensioners, force limiters and height adjusters. Furthermore, there is a child proof rear door lock, high mounted stop lamp and dead locks, AT shift & key inter locks, and an immobiliser. There are even side impact door beams for both front and the rear doors. The car also has ABS and EBD with brake assist. The Maruti Grand Vitara 2.4 AT comes packed with a host of features that seek to ensure a comfortable and enjoyable ride for passengers and also the driver. The power steering doubles up as a multi-function controller that is enabled to even control the stereo system along with other devices. The windows in the front and at the rear are powered electronically and a cruise control system makes driving an enjoyable experience . The pre-fitted air-conditioner also has an automatic climate control feature in addition to an air quality control regulator that keeps the interiors of the car at a suitable temperature and the cabin well ventilated. Maruti Grand Vitara 2.4 AT ensures that passengers in the rear have a wholesome experience too. An arm rest in the middle of the rear seat, a reading lamp and adjustable head rests are provided to this end as are the cup holders and A/C vents. Though the seats are not designed for complete lumbar support, they are comfortable and cosy. Maruti Grand Vitara 2.4 AT offers reliability, stylish looks, a huge fuel tank, and beautiful interiors with an all-time 4X4 mode. 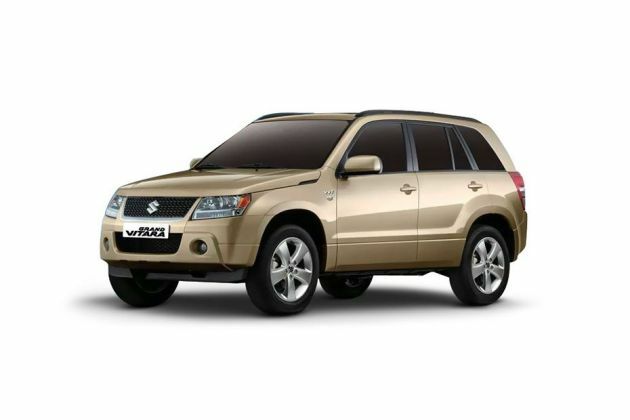 Maruti Grand Vitara 2.4 AT comes at a high price.